A 6-year old boy with Kabuki syndrome and previously diagnosed bicuspid aortic valve was referred for elective cardiology follow-up after his family relocated to a new state. His past medical history was remarkable for developmental delay, bilateral sensorineural hearing loss, visual deficits (strabismus with esotropia, right hypertropia and latent bilateral nystagmus), ureteropelvic obstruction and moderate-severely pronated valgus flat feet. Kabuki syndrome was diagnosed on the basis of clinical features, and a chromosomal microarray was normal. He had no history of hemodynamic instability in the neonatal period; however his parents noted that he would tire from long walks and occasionally require a stroller. On physical examination, the right arm blood pressure was ~30 mmHg higher than the leg blood pressure, and femoral pulses were absent. An echocardiogram confirmed the presence of a bicuspid aortic valve with trace regurgitation and an abnormal abdominal aorta Doppler profile suggestive of aortic arch obstruction [Video 1, Figure 1]. The transverse aortic arch and isthmus could not be identified by echocardiography. Figure 1: Preoperative echocardiogram demonstrating abnormal abdominal aorta Doppler flow profile consistent with aortic arch obstruction. Video 1: Preoperative echocardiogram demonstrating an unobstructed left ventricular outflow tract with trace aortic regurgitation. The study was performed under general anesthesia on a 1.5 Tesla Phillips MRI scanner. Cine SSFP imaging confirmed the presence of a bicuspid aortic valve with normal biventricular size and function. Turbo Spin Echo (TSE) imaging and magnetic resonance angiogram (MRA) revealed a left aortic arch with normal branching, a type B interruption of the aortic arch (between the left common carotid artery and left subclavian artery), and a severely hypoplastic aortic isthmus (between the left subclavian artery and descending aorta). A large, tortuous collateral vessel effectively bypassed the interruption and hypoplastic isthmus by connecting the dilated right subclavian artery to the descending aorta [Videos 2 & 3, Figure 2]. Figure 2: Preoperative magnetic resonance angiogram. The 3D reconstruction demonstrates an interrupted aortic arch with collateral supply to the descending aorta. AAo = ascending aorta; DAo = descending aorta; RSCA = right subclavian artery; RCCA = right common carotid artery; LSCA = left subclavian artery; LCCA = left common carotid artery. Video 2: Preoperative turbo spin echo imaging in a sagittal view demonstrating absence of the transverse aortic arch. Video 3: Preoperative magnetic resonance angiogram 3D reconstruction of the native aortic arch anatomy. ECG-gated, breathe-through phase velocity flow imaging revealed an abnormal flow pattern in the descending aorta (blunted upstroke and persistent antegrade flow throughout diastole) [Figure 3], and retrograde flow in the left vertebral artery which supplied the left subclavian artery [Figure 4]. The patient underwent surgical repair with a 14 mm Goretex interposition graft connecting the ascending to the descending aorta. He recovered well post-operatively without any major complications. Figure 3: Preoperative ascending and descending aorta phase contrast flow profiles by magnetic resonance imaging. The descending aorta flow profile is abnormal with a blunted upstroke and diastolic antegrade flow. 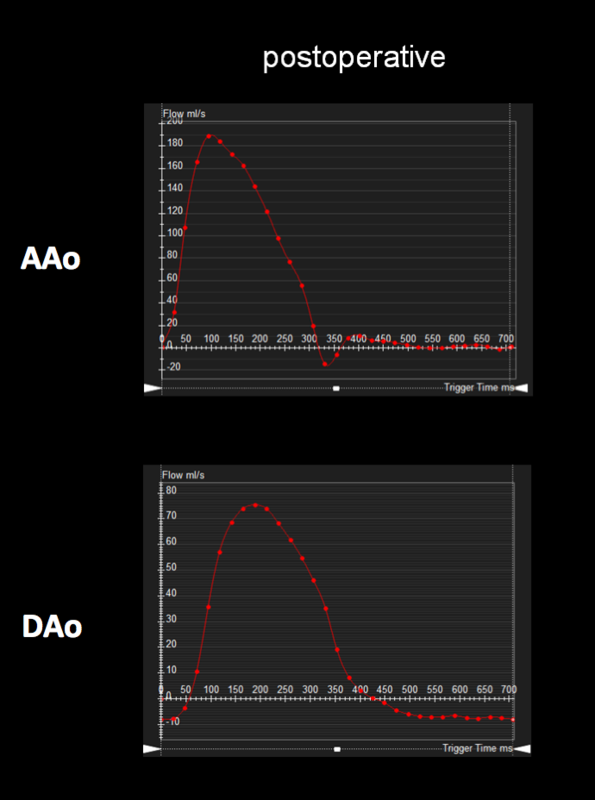 AAo = ascending aorta; DAo = descending aorta. Figure 4: Preoperative phase contrast flow profile in the head and neck vessels by magnetic resonance imaging, demonstrating flow reversal in the left vertebral artery. RCCA = right common carotid artery; LCCA = left common carotid artery. Follow-up postoperative CMR examinations 6 months and 5 years after surgery revealed an unobstructed ascending to descending aorta interposition graft, mild involution of the collateral vessel, and a normal abdominal aorta flow profile [Figures 5, 6]. At 7 years after surgery, he continues to have normal femoral pulses and no right arm-leg blood pressure gradient. He no longer complains of leg weakness with exertion. Figure 5: Preoperative and postoperative comparison magnetic resonance angiograms. The 3D reconstructions demonstrate mild postoperative involution of the aortic collateral vessel. Figure 6: Postoperative ascending and descending aorta phase contrast flow profiles by magnetic resonance imaging. The postoperative descending aorta flow profile shows a normal upstroke with flow reversal in diastole, likely secondary to general anesthesia. AAo = ascending aorta; DAo = descending aorta. Kabuki syndrome (also known as Kabuki make-up syndrome or Niikawa-Kuroki syndrome) is a heterogeneous disorder characterized by distinct facial anomalies, developmental delay, growth delay with feeding difficulties, skeletal anomalies, renal malformations, congenital heart defects, anorectal anomalies and persistence of fetal fingertip pads1,2. Mutations in MLL2/KMT2D (MIM# 602113) are found in 55-80% of the patients, whereas deletions or mutations of KDM6A (MIM# 300128) have been reported in 9-14% of KMT2D-negative individuals3. The RAP1A, RAP1B and HNRNPK genes are responsible for a minority of cases. The clinical diagnosis is often challenging in the first months of life because the phenotype tends to evolve over time and some features become more evident during childhood. Congenital heart defects can be found in 28-80% of Kabuki syndrome patients and include coarctation of the aorta (21%), bicuspid aortic valve (21%), ventricular septal defect (16%), conotruncal heart defects (16%), aortic dilation, and hypoplastic left heart syndrome2, 4. Interrupted aortic arch is a rare finding in Kabuki syndrome patients5. Interrupted aortic arch (IAA) is a congenital anomaly defined as loss of continuity either at the aortic arch or isthmus level. Patients usually manifest neonatal hypotension, metabolic acidosis, poor peripheral perfusion and shock; and thus a late childhood or adult presentation of complete aortic arch interruption is rare6, 7. Stabilization on prostaglandin therapy and surgical repair within the first week of life is the mainstay of treatment8. Risk factors for post-operative complications are older age at the time of surgery and a higher baseline blood pressure. While medical management is feasible, collateral vessels are subject to atrophy and atherosclerosis over time which may lead to worsening aortic arch obstruction. Our case is also remarkable for the presence of retrograde flow in the left vertebral artery due to near isolation of the left subclavian artery. This physiology has been associated with subclavian steal syndrome, in which patients may develop vertigo, syncope and/or arm ischemia with exertion of the affected arm, which diverts blood away from the brain9. We present a case of a patient with Kabuki syndrome who survived without cardiac intervention for 6 years with a type B interrupted aortic arch due to the presence of a large aortic collateral vessel. His symptoms of claudication improved after successful placement of an interposition graft. In this case, CMR provided important anatomic, functional and physiologic information that guided clinical management. 1. Kawame H, Hannibal MC, Hudgins L, Pagon RA. Phenotypic spectrum and management issues in Kabuki syndrome. J Pediatr. 1999 Apr;134(4):480-5. 2. Dentici ML, Di Pede A, Lepri FR, Gnazzo M, et al. Kabuki syndrome: clinical and molecular diagnosis in the first year of life. Arch Dis Child. 2015 Feb;100(2):158-64. 3. Digilio MC, Gnazzo M, Lepri F, Dentici ML, et al. Congenital heart defects in molecularly proven Kabuki syndrome patients. Am J Med Genet A. 2017 Nov;173(11):2912-2922. 4. Digilio MC, Marino B, Toscano A, Giannotti A, Dallapiccola B. Congenital heart defects in Kabuki syndrome. Am J Med Genet. 2001 May 15;100(4):269-74. 5. Cheon CK, Sohn YB, KO JM, LEE YJ, Song JS, Moon JW, et al. Identification of KMT2D and KDM6A mutations by exome sequencing in Korean patients with Kabuki syndrome. J Hum Genet. 2014 Jun;59(6):321-5. 6. Sala A, Alfieri O. Incidental Finding of Interrupted Aortic Arch in an Asymptomatic Adult: To Treat or Not to Treat? J Cardiovasc Dis Diagn. 2017 Jan;5(5):293. 7. Celebi A, Yalcin Y, Polat TB, Akdeniz C, et al. Late presentation of interrupted aortic arch in childhood. Pediatr Int. 2009 Feb;51(1):152-4. 8. E.M. da Cruz et al. Pediatric and Congenital Cardiology, Cardiac Surgery and Intensive Care. DOI 10.1007/978-1-4471-4619-3_28. Springer-Verlag London 2014. 9. Tempaku A, Kuroiwa T, Nishio A. Aberrant left subclavian artery occlusion in right-sided aortic artery associated with left cerebral infarction: A case report. Interv Neuroradiol. 2018 Jan 1: 1591019917753826. Case prepared by: Madhusudan Ganigara, MD, Associate Editor.